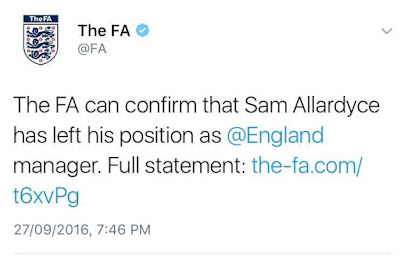 Sam Allardyce has left his position as the manager of the Three Lions - The English FA confirm. He was appointed in July 2016. "Further to recent events, the FA and I have mutually agreed to part company. It was a great honour for me to be appointed back in July and I am deeply disappointed at this outcome." "This afternoon, I met with Greg Clarke and Martin Glenn and offered a sincere and wholehearted apology for my actions. "Although it was made clear during the recorded conversations that any proposed arrangements would need the FA's full approval , I recognise I made some comments which have caused embarrassment. As part of today's meeting, I was asked to clarify what I said and the context in which the conversations took place. I have co-operated fully in this regard. I also regret my comments with regard to other individuals."